I had the most disappointing Pinterest fail this week. So when I finally decided that it was time for those breadsticks, I was more than a little excited about them. Years! Years of looking at these stupid breadsticks and then they just fail me like that. So send me twisty, Parmesan-y breadstick recipes. Please. I need some really awesome breadsticks in my life. This Chicken Parmesan Baked Pasta saved the day though. I’m not usually a pasta fan unless it’s super spicy, has bacon, or is topped with a fried egg but this one really blew my mind. It’s so simple and has so few ingredients but somehow, I loved it. My kids really enjoyed it too. Not one of them complained about the chunks of tomato which is unheard of around here! Add the tomatoes to the bowl of your food processor and pulse until coarsely chopped, about 10 pulses. Set an oven-safe 12-inch skillet over medium-high heat. Add the oil, garlic, oregano, red pepper flakes, and salt and cook just until fragrant, about 1 minute. Add the chopped tomatoes, the water, 1 cup of the chicken broth, and the pasta to the pan, stirring to combine. Bring the mixture to a vigorous simmer, then cover the pan and continue simmering (you may need to reduce the heat slightly) until the pasta is tender, about 16-18 minutes. Stir the pasta frequently as it cooks. Once tender, remove the cover and stir in 3/4 cup of the Parmesan cheese, the pepper, and the chicken. Season to taste with additional salt and pepper if necessary. If the mixture seems dry, mix in as much of the remaining 1/2 cup of chicken broth as needed to loosen it up. Sprinkle the top evenly with the mozzarella cheese and the remaining Parmesan cheese. Transfer the pan to the oven and bake for 5-10 minutes, or until the cheese has melted and bubbles around the edges. Garnish with the basil before serving. 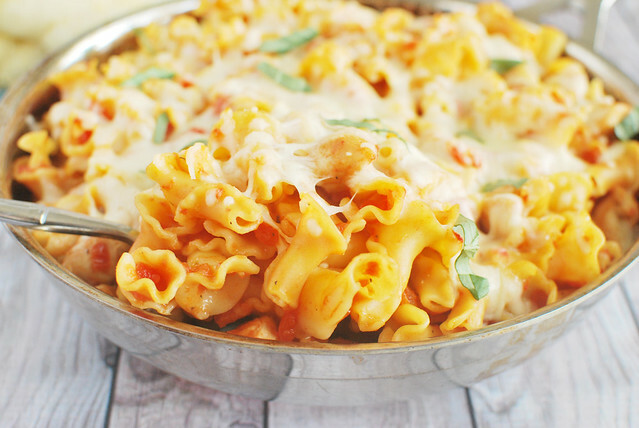 24 Responses to "Chicken Parmesan Baked Pasta"
Well, this pasta looks amazing! Gorgeous photos!! Girl, you are killing me softly with this one. My husband LOOOVES Chicken Parmesan, and they always complain about chunks of tomatoes. What is it about watching everyone pick them out that just gets under your skin and annoys the ever loving life out of a person? 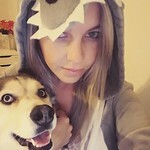 Such a gorgeous photo! I love chicken parmesan and your recipe looks so easy! I have 2 really good breadstick recipes on my site one for Garlic and Herb Breadsticks and then a pizzeria style super cheesy breadstick.. Pinning this recipe for later. This looks so easy – adding it to the list for dinner next week! Hoping my boys will be as cool about the tomatoes as your kids were! Oh that is no fun being so excited about a recipe and then it being a total flop! Totally wish I had a good breadstick recipe to send to you! 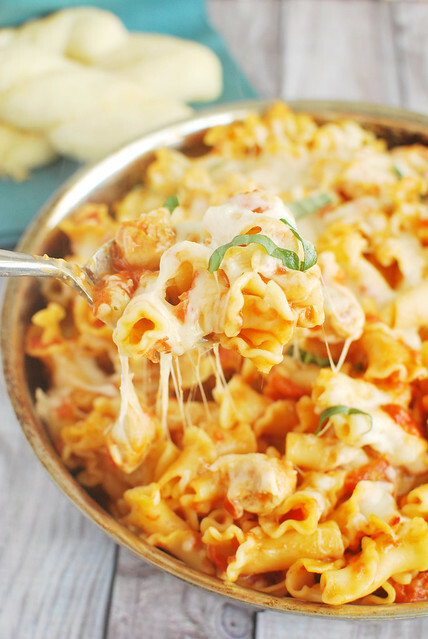 This pasta looks amazing thought – I don’t even think I would have room for a breadstick after having a few servings of this! This looks like it would be an instant hit with anyone! Love those gooey cheese shots! pinned! :) And thanks for the pin on my butterscotch bars the other day! Have a great weekend! Bummer about the Pinterest Fail! That is so frustrating! Looks like this pasta saved the day though!! It looks incredible!! 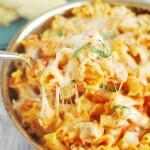 I love pasta and this looks fantastic! Thanks for sharing. Pinned. yum! I love chicken parm. This sound like the perfect kind of dinner as it’s all combined! I love chunks of tomatoes! LOL. Chicken parmesan is always comforting for dinner. Especially, with pasta! Someone posted this on Facebook today and I made it for tonight’s dinner! I made a few changes using crushed tomatoes, part of a rotisserie chicken, several fresh basil leaves and a small can of tomato sauce. It was delicious and with whole wheat pasta, pretty healthy too! I loved how it all prepared in one pan. Thanks for sharing! Did you drain the crushed tomatoes? How did you prepare your chicken? Boiled? Skillet cooked? Breaded? I love pasta dishes like this! Oh this looks amazing. I have to cook for 16 goals and would like to make this in advance and freeze it. Do you know if it freezes well? This looks great! Will give it a try this week. I think I’ll sneak some spinach in as well, stir it in just before it goes into the oven. Kids love chicken parmesan so this should go over big. Thank you!! I made this with a large jar of tomato and garlic pasta sauce instead of the tinned tomatoes etc, as that’s what I had to hand. It was so easy and thoroughly enjoyed by the whole family. Definitely a keeper. You don’t say in the directions when to cook the chicken before adding it at the end. Do you throw it in the mix to cook with everything else before baking it or cook it seperate? No, it should already be cooked when you add it in. You can use a store-bought rotisserie chicken or I always cook a few breasts in the slow cooker – they shred up really nicely that way!